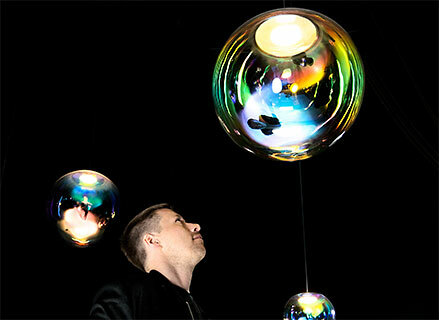 Dichroic colour effect glass opens up new possibilities for combining the functionality of glass with colour aesthetics. These non-coloured filters transmit light with virtually no limits, yet they can shine in brilliant colours, depending on the angle of the light and the viewing angle. This is referred to as the dichroic effect, which occurs due to the interference of light waves with thin, visually transparent layers, causing white light to be refracted into separate colours. Incidental light is not absorbed and therefore not transformed into thermal radiation. Thus, this exceptional design glass is perfect for architects/construction planners, designers and artists. 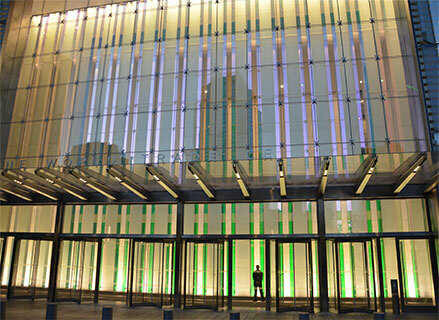 The expressive interplay of colour transmission and the reflection of a particular complementary colour resulting from the use of colour effect glass makes construction elements such as glass façades and glass roofs more attractive and highly unique. Our special glass features exceptional temperature and weather resistance. Its triple bond structure makes it extremely stable and compliant with all construction regulations. The colour effect is independent of the size of the surface. Even a relatively small amount of colour effect glass used on the entire glass surface can produce fascinating colour effects. This breathtaking sight is equally impressive whether observed by day or by night, from the inside or outside. Wherever light and movement, colours and variance are key design aspects, colour effect glass has proven to be a material with exceptional powers of expression and radiance. Dichroic glass has become a construction material as exclusive as it is functional, for elegant room division or room-in-room design. Optically weightless and yet highly stable, it can divide rooms, alter their layout and transform them into a visual experience. The glass appears transparent at one moment and, seconds later, reflective in variable colours when seen from another angle. We recommend our special glass especially for doors. Glass doors are not only exceptionally beautiful, they are also stable, easy to maintain and very secure. On the one hand, they catch the eye with their unexpected play of colours; on the other hand, they are made of laminated safety glass. It is break resistant and, in the event of damage, the glass shards remain bonded to the safety film. The doors are finished to your specifications before delivery. Our colour effect glass is available in 20 standard colours. We can also create design glass according to your specifications. Here are the four most commonly used design colours with their day and night effects. The colour effect of the dichroics depends on the lighting. In the light of day the result is a sensational superposition of the colours of the top and transparent views. At night, the colour perception depends on the position of the light source and of the observer. If both are located in front of the filter glass, the top view dominates, while if the viewer is on the one side and the light source on the other side of the filter, the transparency dominates. Colour gradients are also possible. These are always composed of colours from the subtractive colour spectrum – for example, from orange and yellow to magenta, cyan and blue. The colour range of the gradients and their length can also be chosen. Design studio KUKKA: Dichroic glass for "Window Blinds"
Infoletter 1, Topic "Color effect glas in architecture"
The cooperation between the young artist Inga Danysz, born in Warsaw in 1990, and Prinz Optics in creating the walk-through sculpture of colour effect glass “Color Fields” is paradigmatic for the company’s service and support centre. 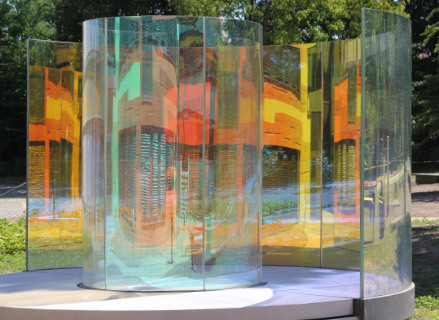 The project was an extremely complex task: for her sculpture at the new “Johanna-Quandt-Zentrum” at Frankfurt’s university hospital, the artist wanted large, curved glass panes from our transparent and yet at the same time colourful, reflective dichroic glass. During our collaboration with the Berlin-based company NEO/CRAFT, manufacturer of innovative design objects, we were faced with an unusual challenge: to apply an iridescent coating to spherical glass lamps. After much deliberation and extensive field tests, we succeeded in developing the right technology that enabled us to apply a consistent, even colour effect coating on spherical surfaces. This resulted in the captivating, iridescent white light of the spherical lamps. Visitors walk into the highest skyscraper in the western hemisphere through the north and south side entrances with 20 metre high lobbies. The radiance of the glass installations in front of the baffle walls is also impressive. VarioTrans® colour effect glass, manufactured by PRINZ OPTICS, is built into the installations. The colour effect stripes change from emerald green to violet depending on the viewing angle and the angle of the light. is the title of an anthology of dichroic glass in fine arts and architecture. In this unique retrospective, the Stromberg manufacturer of special glass, Prinz Optics, presents 14 artists and architects and their works. Hardcover, 104 pages. 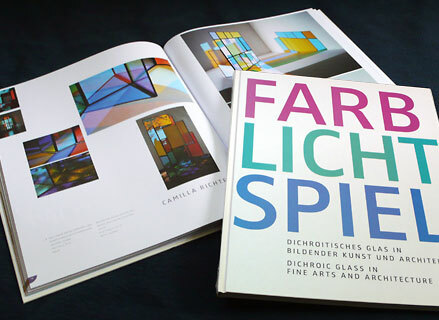 This documentation of contemporary colour-effect-glass art and architecture can be purchased from the publisher.